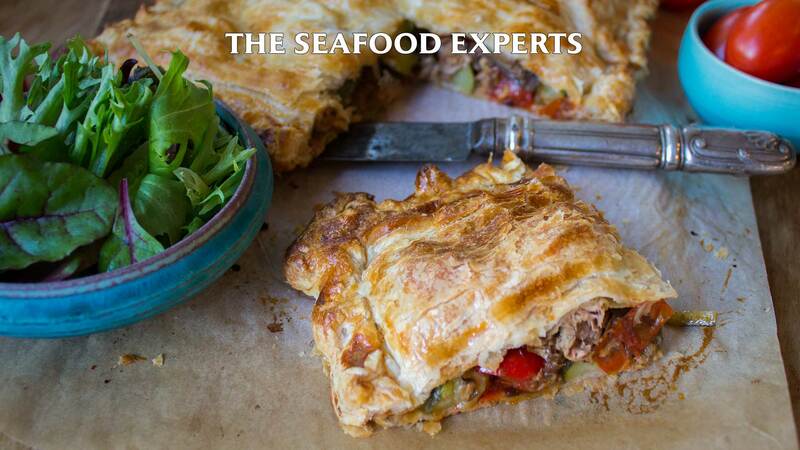 This Mediterranean tuna vegetable pie is full of delicious nutritious vegetables and omega 3 rich tuna. These hearty tuna, vegetable and pies are easy to make and are great for a weeknight dinner for the family. In a large sauté or frying pan, add the olive oil and onion, then sauté for about 5 minutes until the onion softens and starts to change colour. Add the eggplant and capsicum and cook for 5 more minutes, stirring occasionally. Add the garlic, tomatoes, oregano and the water. Cook down until the liquid has almost totally evaporated, tomatoes are soft and the other vegetables are tender. Stir in the zucchini and season with salt and pepper. Remove from the heat and allow to cool. Lay a sheet of pastry on the baking tray. Stir the drained tuna into the cooled vegetable mixture. Pile the vegetable and tuna mixture high on the centre of the pastry. Dampen the edges of the pastry with water and place the second sheet on top. Using your fingers, press the edges of the pastry together and crimp with a fork to seal. Brush the pie all over with beaten egg. Bake for 10 minutes at 190°C, then cover the pie with baking paper and reduce the oven temperature to 170°C. Cook for a further 30 minutes or until the pastry is crisp and golden and the filling is piping hot. Serve right away with a salad or your favourite green vegetables. Serve right away with a salad or your favourite green vegetables.